Chicago birthday celebrations might be getting a lot more dangerous. The first U.S. outpost of a Canadian company that hosts axe-throwing parties is opening in the Windy City in mid-September, DNAinfo Chicago reports. 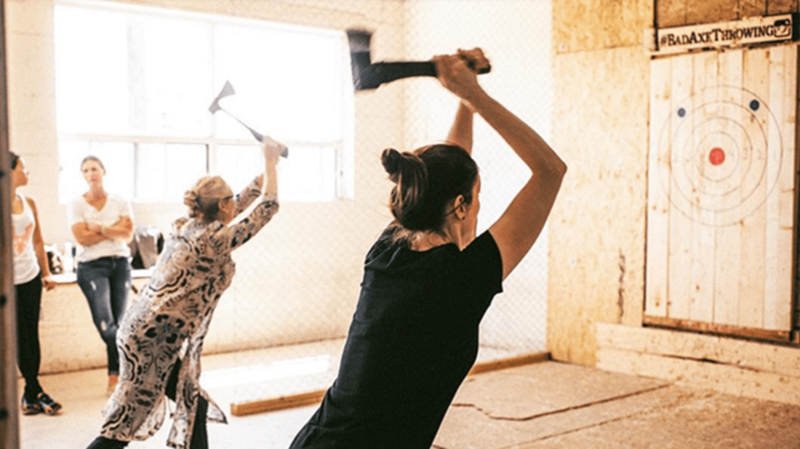 Bad Axe Throwing, which advertises itself as a destination for birthdays, corporate events, and bachelor/bachelorette parties, has 10 locations across Canada already. It even hosts 8-week-long axe-throwing leagues. Imagine blending your dreams of starring in Robin Hood with being a lumberjack, all inside an indoor shooting range. The Chicago range opens on September 9. They provide the axes and the targets, and you bring the beer. Granted, you’re not allowed to be visibly drunk, but you can BYOB, as long as it’s not hard alcohol and comes in a can. Axe-throwing competitions are a standard of lumberjack competitions (a real thing) and Renaissance Fairs in the U.S. already, but for most urbanites, this will be a rare opportunity to start hurling hatchets around—or even just holding hatchets. And according to the Chief Axe Thrower at Bad Axe, it’s not that hard: Most people get the hang of it and hit the target by their fifth throw or so, he told DNAinfo. Probably a good thing, because no one wants to stand next to the axe-thrower with irreparably terrible aim.